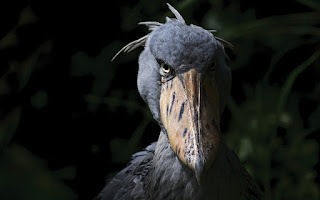 The shoebill also known as whalehead, is a very large stork-like bird. It derives its name from its massive shoe-shaped bill. It has a somewhat stork-like overall form and has previously been classified with the storks in the order Ciconiiformes based on this morphology. However, genetic evidence places it with the Pelecaniformes. The adult is mainly grey while the juveniles are browner. It lives in tropical east Africa in large swamps from Sudan to Zambia. The shoebill is a tall bird, with a typical height range of 110 to 140 cm (43 to 55 in) and some specimens reaching as much as 152 cm (60 in). Length from tail to beak can range from 100 to 140 cm (39 to 55 in) and wingspan is 230 to 260 cm (7 ft 7 in to 8 ft 6 in). Weight has reportedly ranged from 4 to 7 kg (8.8 to 15.4 lb). A male will weigh on average around 5.6 kg (12 lb) and is larger than a typical female of 4.9 kg (11 lb). The signature feature of the species is its huge, bulbous bill, which is straw-coloured with erratic greyish markings. The shoebill is noted for its slow movements and tendency to remain still for long periods, resulting in repeated descriptions of the species as "statue-like". They are quite sensitive to human disturbance and may abandon their nests if flushed by humans. However, while foraging, if dense vegetation stands between it and humans, this wader can be fairly tame. The shoebill is attracted to poorly oxygenated waters where fish frequently surface to breathe. Exceptionally for a bird this large, the shoebill often stands and perches on floating vegetation, making them appear somewhat like a giant jacana, although the similarly-sized and occasionally sympatric Goliath heron (Ardea goliath) is also known to stand on aquatic vegetation. Shoebills typically feed in muddy waters and, being solitary birds, forage at a minimum distance of 20 m (66 ft) from one another even where relatively densely populated. The population is estimated at between 5,000 and 8,000 individuals, the majority of which live in swamps in Sudan, Uganda, eastern Democratic Republic of the Congo, and Zambia. There is also a viable population in the Malagarasi wetlands in Tanzania. BirdLife International has classified it as Vulnerable with the main threats being habitat destruction, disturbance and hunting.